These great tips can help you get the results you want: to sell your home for the most money in the least amount of time. Buyers will have an emotional response of some kind when they see your home for the first time. The feeling you want to leave them with is, “This could be my home.” Achieve this by making your home’s exterior stand out, and by staging the interior. Power wash the outside of your home, and make sure the windows are washed too. Keep your driveway and sidewalks clear, and your house well-lit at night so buyers can easily spot the property and make it to the front door. Consider painting your front door a cheery color, and spruce up your landscaping so your home really stands out. Remove personal mementos like personal photos, memorabilia, and knick knacks that clutter shelves or counter tops, so buyers aren’t distracted by your decor or personal taste. Hire a professional cleaning company to come once weekly during the selling process. Open all the window treatments during the day, to make sure your home is as well-lit as possible. If showing at night, add plenty of floor lamps or desk lamps to make your home look warm and inviting. If you’re planning to price your property high and bring down your price gradually, think again. Homes receive four times the traffic in the first two weeks after listing, so a property lagging on the market can be a red flag to today’s buyers. Think about the eager buyers who will see your home in “Just listed” ads across the web and in email alerts, and offer them a fair price right away. 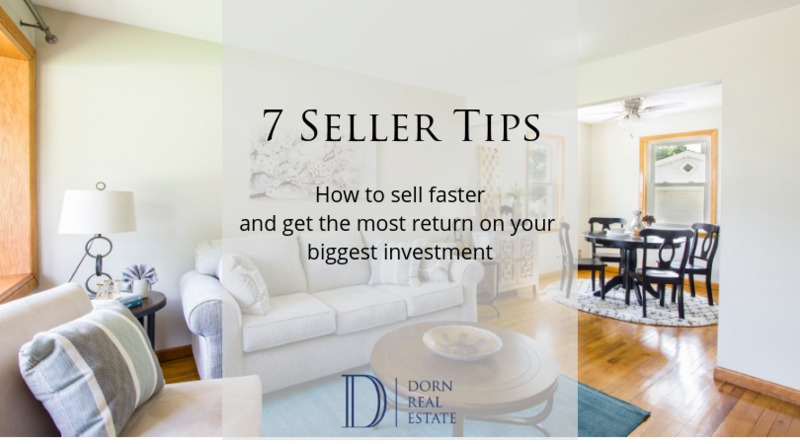 The feeling of getting early showings or an offer will far outweigh the feeling of an offer that comes after you’ve lowered your price a month later. To make sure you price your home right, obtain a comparative market analysis of recently sold properties relevant to your home’s size, location and condition. Together we will work to find a price that matches the local Knoxville norm, while taking into account your home’s individual features and upgrades. Many large, expensive remodeling projects simply don’t pay off when you sell your home, so remodeling a whole room is just not worth the time and money. Instead, complete small, inexpensive updates that will help you get top dollar for your home. Paint boldly colored walls to a more neutral palette, and paint over any scratch marks on white walls. Instead of buying new kitchen appliances, consider painting the cabinets white, and add modern cabinet hardware and light fixtures. Rather than replacing your avocado green toilet and sink, go stark white on all walls and add a funky vintage vibe with your shower curtain and bathroom artwork. Clean your home after every meal and between laundry days. Don’t leave for work, or even a quick trip to the store, without making sure your home could be toured before you return. Your neighbors want good neighbors – and they may also know someone who wants to live in the neighborhood. By getting your neighbors involved in your sale, you may save time. Make sure you or your agent invites your neighbors to any open houses you hold, and use social media posts to mention that your home is being listed. Every time you mention your home sale to a neighbor, whether it be online or offline, remember to ask if they know anyone who may be interested. You’ll be amazed at how quickly the word spreads! Across the country, most sellers are at an advantage in the market. But if your home isn’t quite modern enough, or isn’t as nice as the one down the road, you may have to sweeten the pot by paying closing costs, a buyer’s home warranty, or even just getting a pre-sale home inspection so buyers are confident in your home’s ability to sell as-is. Don’t assume you’ll get multiple offers and your choice of well-qualified buyers. Be realistic about how your home will be received, and you could end up selling sooner. Ready to sell? Contact us today to discuss how we can exceed your expectations.